Feather Flags: made with 200 Denier SolarMax Nylon, these are a great way to draw attention to real estate Open Houses, retail specials, automobile dealer promotions or even your tailgate party. Easy to install, they make a terrific roadside display. 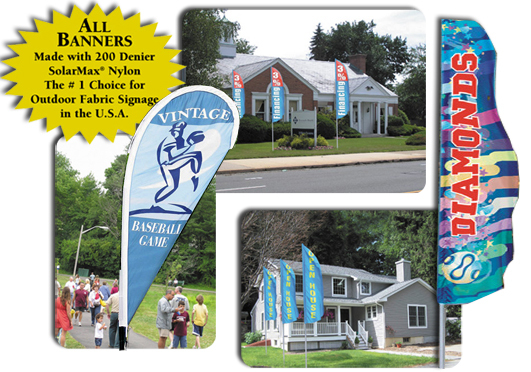 Teardrop and Sun Blade Banners: made with 200 Denier SolarMax Nylon, great attention getters for indoor and outdoor use. Offered with a variety of mounting options, these "fabric signs" are frequently used for retail P.O.P. displays, fairs and festivals, real estate signs [particularly Open House], and roadside displays, and even trade shows.